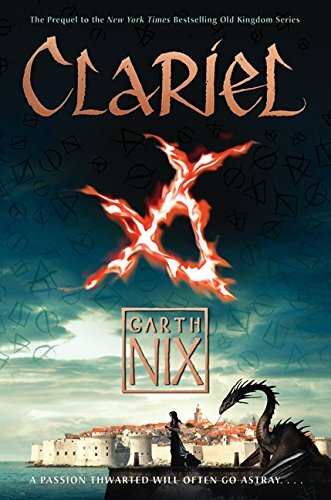 I haven’t reviewed them here, but I have read and enjoyed Garth Nix’s Abhorsen Trilogy, so I was a bit excited for his new prequel, Clariel. In fact, I put it on reserve at the library before the release date, and I’m pretty sure I was the first reader of my copy. It turned out to be an entertaining fantasy–although I may have set the bar too high, as I didn’t love it as much as I had hoped. Clariel is set 600 years before the Abhorsen Trilogy, in the Old Kingdom where Charter magic does everything from providing spells for light to entrapping Free Magic monsters. Clariel and her parents have recently moved to the capital city of Belisaere, but all Clariel wants is to return home and take up a solitary life in the Great Forest. In Belisaere, her family connections to both the aging king and the Abhorsen (a kind of magical Enforcer) make her a potential pawn for dangerous factions, and entangle her in dangers both political and magical. Nix’s world and magic system have always been very cool, and that continues here. In a way we get to see ordinary life in the Old Kingdom, and how magic fits in for a more typical person. I mean, Clariel isn’t exactly average, but comparatively… In Sabriel we were deep into the Abhorsen’s role as anti-necromancer (sort of), and in Lirael we were with the prophesying Clayr. Here we get to see people who aren’t high level mages, but still have Charter Marks performing functions in their homes. And the magic does kick into higher gear in the last hundred pages or so, as Clariel herself starts testing new limits. I have mixed feelings about the plot. There’s intrigue and danger and mysteries and all of that is good…but there also seem to be a lot of stretches in the beginning of Clariel just hanging around Belisaere, and a lot of ideas or elements that never seemed to be developed as much as they could or should have been. We spend a big chunk of time being introduced to Clariel’s school…which she attends for about two days. And we spend a lot of time with her maid, who turns out to be a spy for the enemy, except I’m not quite sure why or how that matters, either to the plot or to Clariel! The plot gets better in, again, the last hundred pages. The focus narrows and Clariel takes a more active role. I also enjoyed it when Clariel went to the Abhorsen’s House, which I recognized from the trilogy (and met a certain cat, who I also recognized!) Incidentally, that’s when the dragon on the cover finally shows up too. There is a lot that’s good in here…but I think the reason I didn’t like it as much as I wanted to was because I didn’t like Clariel as much as I wanted to. For most of the book, her one driving interest is to get back to the Great Forest. I may have felt very differently about her if we had started the book seeing her in the Great Forest, to understand why she loves it…but as it is, we start with her in Belisaere, and she spends a lot of time just hating everything around her, and being totally disinterested in everyone around her too. We get one more magical-ish element in here, as Clariel discovers she possesses the Rage, a temper that can send her into another state of mind where she loses all control but also gains incredible physical and mental strength. Clariel’s struggle to control it and turn it from a curse into a tool is engaging. Except! I didn’t quite believe the reactions of the people around her. When Clariel loses control, she nearly tears people limb from limb (literally), and on two occasions someone sees this and responds by…giving her a book to study. I’m all in favor of the power of books, mind you. But…the situation seems to call for a more immediate and drastic response! I’m guessing Clariel is somehow related to Chlorr of the Mask which, if true, somehow predisposes me to assume there aren’t pat resolutions to this story, unlike Sabriel’s and Lirael’s. Still looking forward to reading it! I’ve read the Old Kingdom trilogy and liked it, so I’ll have to pick this one up some time. My sister is the big fan, and she said she liked it. I put a lot of Clariel’s idiosyncrasies down to the fact that she’s a teenager and is going through the I-hate-everything phase of her teenage years. Since she’s not living among the Clayr or actively engaging in making sure the dead stay dead, she’s got a lot more space than either Sabriel or Lirael did to be a bratty teen instead of being forced to grow up.